AEGEE-Barcelona is one busy antenna! They have meetings every Saturday where they meet, socialize and discuss the future of their antenna. In one of those meetings a while ago, they decided to host Fundraising European School (FRES) and it is that particular event that has made them become the Local of the Month of October. The AEGEEan interviewed Clàudia Nogués, who is the newly elected President, as well as Anna Gumbau, the Vice-President and co-main organiser of FRES. The AEGEEan: How does it feel to be selected Local of the Month? AEGEE-Barcelona: First of all, we did not expect to be elected as Local of the Month, so it was a great surprise for the antenna. Moreover, after organizing a good and hard-working FRES (Fundraising European School) it was the way to recognize our effort. In the name of all members of the antenna we want to thank you so much for this honor that The AEGEEan has awarded us with! How do you keep your members active in your antenna? 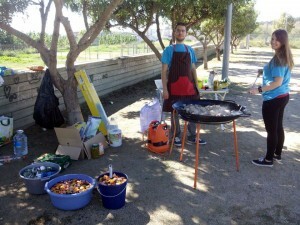 We try to do many activities with different topics: ranging from our traditional weekly meetings and different lunch meetings such as barbecues or paellas for the members and friends (it is a strategy to get new members, too!) to excursions to discover Catalonia. Furthermore, we encourage all of them to apply for the hundreds of events happening around Europe, from Agorae until New Year’s Eve, and get steeped in AEGEE spirit. You have elected a new board in October. What have been the highlight(s) of the past board year? We are very happy with the activities and events that we have organized during this year, and the goals that we have reached. For example we prepared Agoraphobia, the pre-event for Autumn Agora Zaragoza, with lot of success. 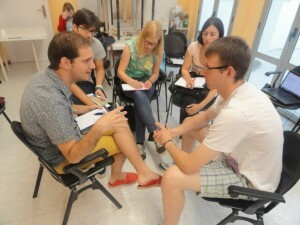 Also we have done our usual Travel Summer University, in this case with AEGEE-Valladolid. In order to put an end to a great year, we wanted to organize a serious and formal event as Fundraising European School. 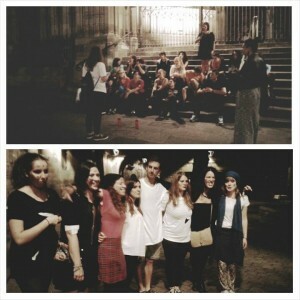 But AEGEE-Barcelona doesn’t focus only on organizing events! We work everyday to maintain our members happy and help them with all they need. Also, we try to be present in different universities and make AEGEE more visible. So now we wish for the new board of AEGEE-Barcelona a bright future during this year and to keep working with our aims. How was the organization of FRES? Organising the Fundraising European School was a really big adventure: we had to prepare the budget, the social programme and all the logistic arrangements in a very short period of time, practically during only one month, since the event was right after the summer holidays and most of our corporate and institutional partners were out for vacation. Moreover, it is very demanding to stay full of energy, during almost ten days, for such an exhausting event… But yay, we managed! Really, initially we organised the FRES because even though AEGEE-Barcelona has organised several events, most of them have been purely fun/leisure, with neither any learning content behind it nor any contribution to the Strategic Plan and the Action Agenda. Therefore it was a great way to step out from our comfort zone and try something new. The result, seeing that participants were having fun and enjoying the event, was really rewarding. On the thematic aspect, we got to learn how a training event is from the inside. Moreover, when we had some spare time, we always sat next to the participants during training sessions and took notes of what the trainers were saying, so we actually learnt some things regarding fundraising! On the purely organisational aspect, we learnt a lot regarding time management, and especially the importance of having a strong team, which is coordinated and has the same vision on the event. What was the best thing about organizing the event? 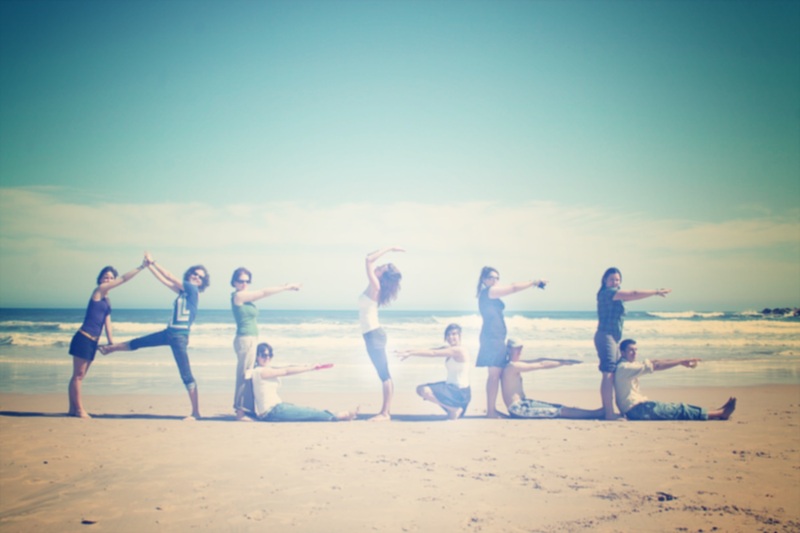 Teamwork, without any doubt. When some locals organise such big events and the organisers spend so many hours working together, sometimes in very stressful situations, they always run the risk of fighting with each other, having arguments, facing misunderstandings… This was not the case in AEGEE-Barcelona, instead we always worked as a team, rowed in the same direction, got to know each other’s strengths better, and it made our friendship grow stronger. Moreover, we had many new and motivated members who learnt a lot about event management by taking active steps and we had kind of a knowledge transfer “on the spot” and while the event was taking place. Just because of this, all the effort was worth it. Alright, the event is still too close to consider doing it again! Well, probably not FRES, and probably not even another European School, but since we have really learnt many valuable lessons in event management, we will surely come up with some other thematic event some time soon. The 30th Anniversary of AEGEE, the two upcoming Statutory Events in Spain… These are both some good excuses in order to challenge ourselves once again. 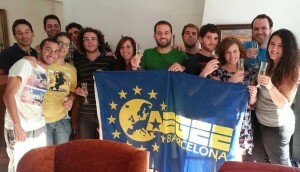 What plans does AEGEE-Barcelona have in the near future? The new board has started with extra-motivation, with a team ranging from “oldies” to a new generation. Our main goal for this year is to keep doing things as good as the previous board. We want to organize, for example, pre-events for the EPM in Burgos and AgorAsturias. Also, we have started to think about the next Summer University. Furthermore, we are happy to have exchanges with some antennae, a part from the usual visits that we have during the year from other Spanish antennae with their Erasmus in Barcelona; moreover, we are also planning to get engaged again with the Catalan Youth Council. To finish, we would like to create a twin antenna for the next two years! ← AEGEE-Europe is going east with its new contact in Tyumen!